Last week in honor of our 6-month wedding anniversary and my new job, my husband and I decided to take a road trip for fun. Our destination: Grand Rapids. We woke to a beautiful sunny day with temps in the 50’s, which made the 2-hour drive that much better. Upon arriving in Grand Rapids, we headed to the Grand Rapids Public Museum but as we started to turn onto the road, we spotted the Gerald R. Ford Presidential Museum across the street. Ford, the nation’s 38th president, was raised in Grand Rapids. Both of us are history fans and neither had been to a presidential museum so we decided to visit this unique institution. Free parking is located next to the museum, which also offers student, military and senior admission discounts. serves as archives and museums, preserving the history of presidents and our nation. 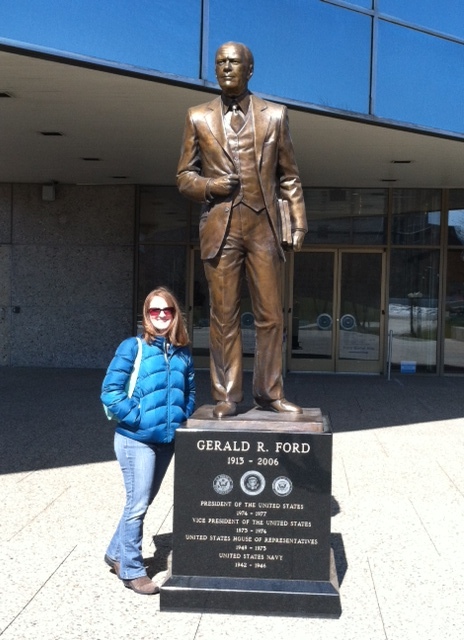 President Ford is the only one with a separate museum and library (located in Ann Arbor). Once you pass the ticket counter, a piece of the Berlin Wall is on display in the lobby. When you enter the exhibit galleries, you are transported back in time, from the beginning of President Ford’s life, through his career, his marriage to Betty Ford, and his political career, culminating to vice president and president without being elected. This of course was a challenging time in U.S. history, with Watergate, Nixon’s resignation, Vietnam and foreign policy pressures. There were several small details that I found interesting. Gerald Ford was actually born Leslie Lynch King, Jr. His dad left the family when he was young so when his mother remarried, his stepdad, Gerald R. Ford, Sr., gave him the family name. Ford was a success in football, playing for the University of Michigan before being recruited by the Detroit Lions and Green Bay Packers. He chose to attend law school. He had a really successful naval career during World War I. He had two assassination attempts on him in San Francisco, beat Ronald Reagan in the Republican primary before losing the 1976 presidential election to Jimmy Carter. Throughout the museum, awesome artifacts stuck out. 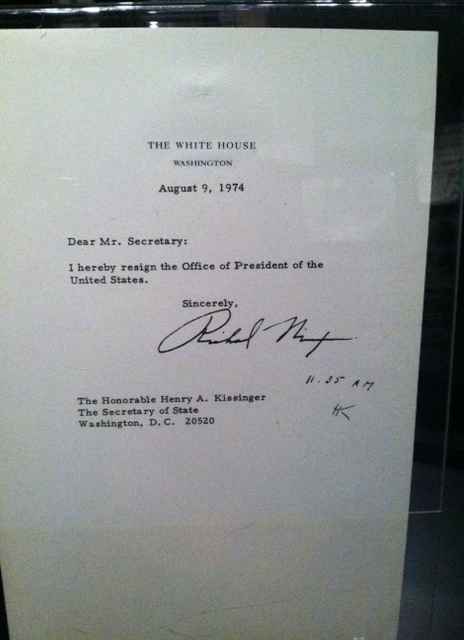 Nixon’s resignation letter. A gun held in an assassination attempt. Transcripts during a Watergate hearing. Copies of Ford’s travel schedule to Japan (with notes on customs, formality, relationships, etc). discussion with a senator or guest on the couch beside the fireplace. 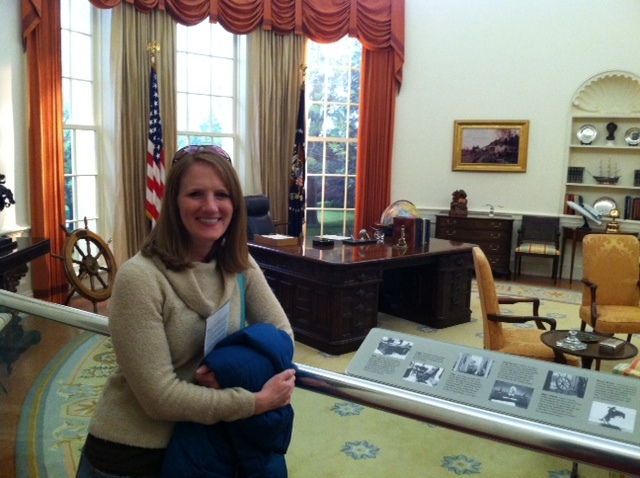 When you walk into the Oval Office exhibit, a 6-minute audio loop begins, highlighting a day in the office of President Ford. The Cabinet Room, decorated as it was during the Ford administration, welcomes you to sit in the chairs surrounding the long table, feeling the power and impact of the key government people who sit at the table with the president. The chairs have small plaques on the back indicating who sits where (President, Vice President, Secretary of Commerce, Secretary of State, etc). We really enjoyed exploring this part of history that weaved from Michigan to Washington. After leaving the museum, it was time for lunch at Founders Brewing Company. It was packed due to the release of one of their beers. There isn’t a hostess stand so you have to stand near the tables and pay attention for people leaving. Appetizers and sandwiches are the primary options on the menu (big size and good-tasting). My favorite Founders’ beer wasn’t on tap (Cerise), but the waiter suggested making their Pale Ale beer into a Shandy, which was delicious. Justin tried a flight – Oatmeal Stout (brewery only), Curmudgeon Old Ale and Porter. The weather was so nice after months of cold, gray days that we decided to wander around downtown. We found a geocache and then with no destination set, we walked for many blocks, finally spotting a Starbucks (surprise!) where we sat for a bit with our chai lattes to discuss life. Grand Rapids impressed us. The downtown area is clean, vibrant and very walker-friendly. There is a wonderful boardwalk that follows the water. Lots of people were walking and biking throughout the day. We live about 30 minutes outside of Detroit so feel sadness and frustration at the challenges facing the city. Walking around Grand Rapids made us realize how great a clean, financially strong city would be for southeast Michigan. I love our road trips and adventures. I love the opportunity to have fun with my husband and the great conversations that naturally occur when it’s just us. I love that we laugh, hold hands and feel comfortable with each other. I love knowing that my husband loves me. Founders has some great beer and fun ambiance. We’re going back in two weeks to visit friends. And Bell’s Brewery is about an hour from Grand Rapids. And there are several great breweries in metro Detroit. 🙂 Lots of good choices. We’re lucky.